I love a good body oil, and one that is at an absolute steal of a price is even better! It’s the perfect thing to keep on hand at any time of year, in particular when the cold starts to hit or – at the opposite end of the seasonal spectrum – when you’ve seen a little too much sun and your skin really needs a drink. 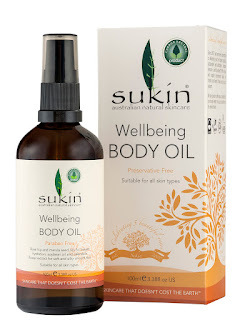 Sukin have just released a limited edition Wellbeing Body Oil, which is a 100 per cent natural and luxurious blend of botanical oils helps to “soothe skin and balance the mind”… sounds like exactly what I need this silly season! Its yummy formula includes a combination of Rosehip oil that offers the skin an instant hit of hydration, while antioxidant rich Marula seed oil is in there to soothe and improve skin texture. Also included is Soybean oil (rich in EFA's for deep skin conditioning), along with calendula flower extract, which is rich in beta-carotene to soothe and help regenerate damaged skin. This sounds like the perfect after sun treatment to me, and one I’m hoping to bust out once we actually get some sun. Suitable for the body or the face, you can use it for massage or as bath oil, post shaving or waxing and as a hand or foot treatment as it leaves no oily residue. Oh and here’s the ‘steal’ bit: Sukin Limited Edition Wellbeing Body Oil has an RRP of $28.99 for 100ml, which given the luxurious mix of oils makes it a damn good buy.